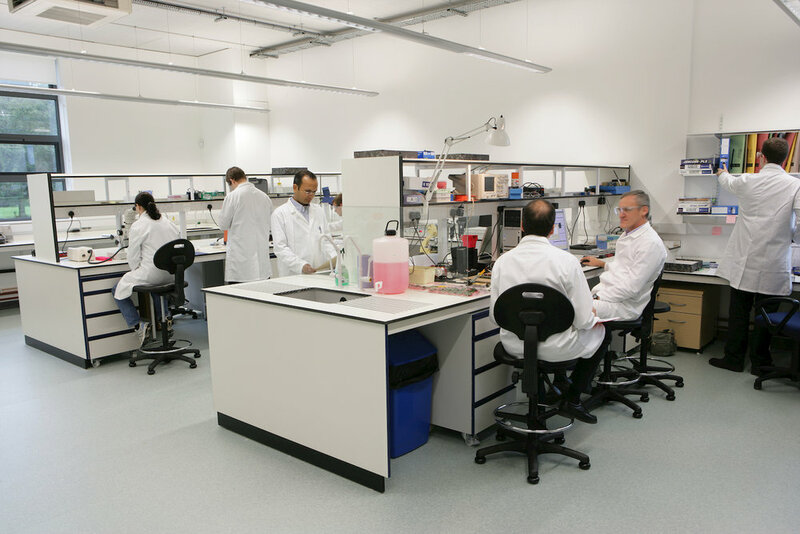 We have worked with the University of Oxford for many years to design new, and refurbish existing, science and research laboratories. The Begbroke campus is located a few miles outside Oxford city centre. The Park is home to a mix of researchers from a variety of science and technology fields. They work alongside business entrepreneurs who have associations with investors and multinationals. The largest of the buildings we designed is the Institute of Advanced Technology (IAT). It is used by University departments needing space for research projects, including research into robotic vehicles, environmental science and hydrogen power. Another building on the Park is the Centre for Innovation and Enterprise (CIE). It provides workspace for an array of both academic and business communities; from advanced engineering and nuclear materials, to robotics and nano-medicine. For both the IAT and CIE buildings, the brief was for adaptable laboratory space that could easily suit new research projects during the long life of the buildings. To meet this specification, we developed the ‘periscope’ cross-section; a clever way to take ducts, such as fume cupboard discharges, to the roof. For both the IAT and CIE buildings, the brief was for adaptable laboratory space that could easily suit new research projects during the long life of the buildings. To meet this specification, we developed the ‘periscope’ cross-section; a clever way to take ducts, such as fume cupboard discharges, to the roof. Learn how the design of these original buildings worked. With an increase in demand for space, the University wanted a new facility like the CIE. In architecture, however, much moves on in ten years. So we took the best concepts from the original CIE design, and improved it. Using cross laminated timber for the external walls, the building fabric was made more robust. We developed this new envelope composition to increase air tightness and durability, as well as improve value for money and construction speed. To satisfy the client’s specification for a BREEAM ‘Excellent’ rating, we designed-in many additional features, including improved thermal insulation and renewable energy sources. We have exceeded the expectations of our client by developing a building that is inherently sustainable.